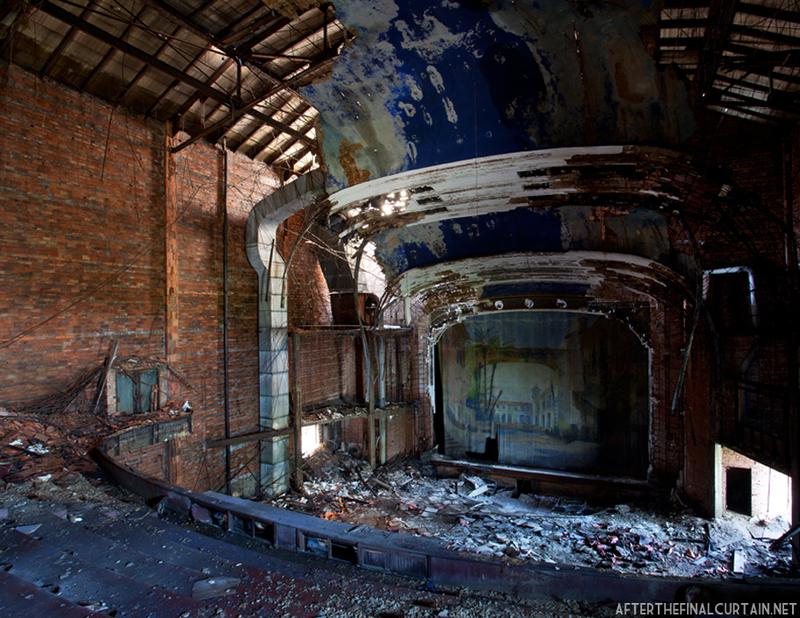 The Palace Theatre opened on November 26, 1925 in Gary, Indiana. 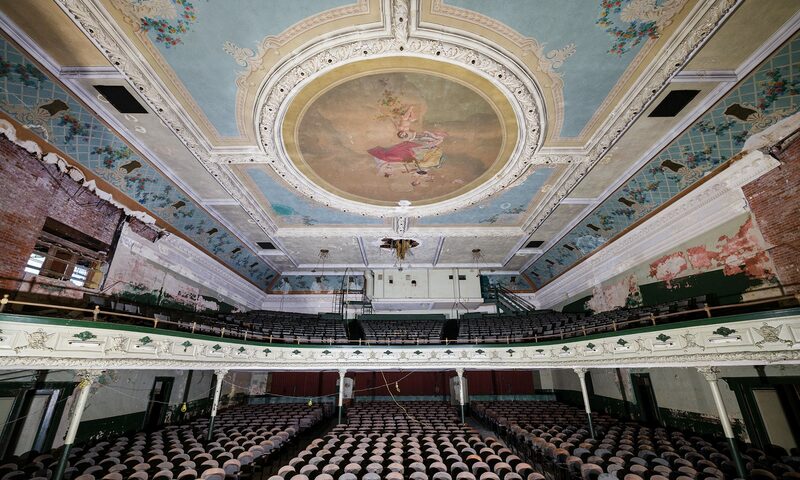 The 3,000-seat atmospheric theater was designed by John Eberson, a renowned architect known for the design of the Paramount Theatre in nearby Anderson, Indiana. 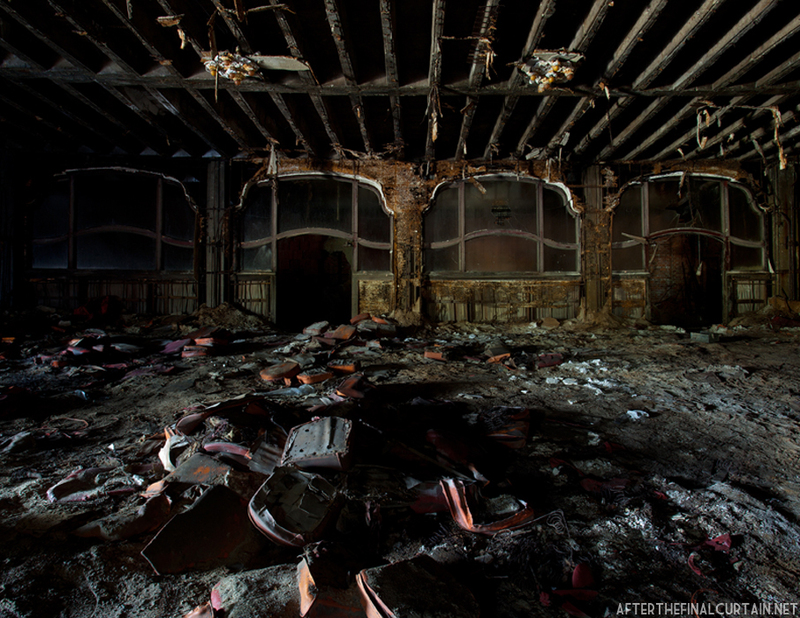 The Palace was originally a vaudeville house before it began showing only movies in the 1930s. When the steel industry began to decline in the 1960’s crime steadily rose in the area, leading to, among other incidents, the 1968 stabbing of a man in the crowded Palace lobby. The Palace closed for the first in 1972. It reopened three years later as the Star Palace Theatre, but closed again when the owner could not afford to pay the utility bills. 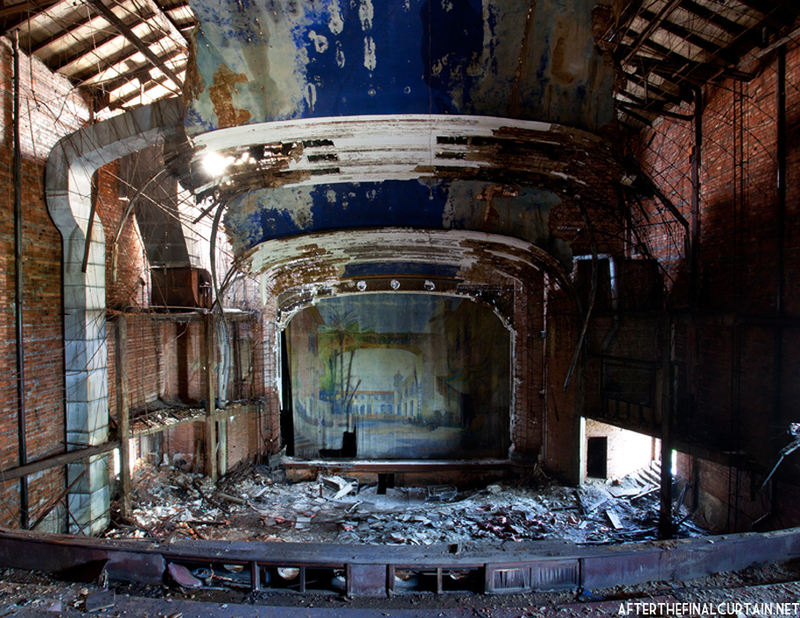 In 1976 it reopened for the final time as the Star Academy of Performing Arts and Sciences, but shuttered soon after when funds from a government grant used to reopen ran out. The exit to the lobby area from the auditorium. In 2002, Donald Trump had the marquee restored and the words “Jackson Five Tonight” placed on it as tribute to the band’s hometown. The letters have since fallen off. 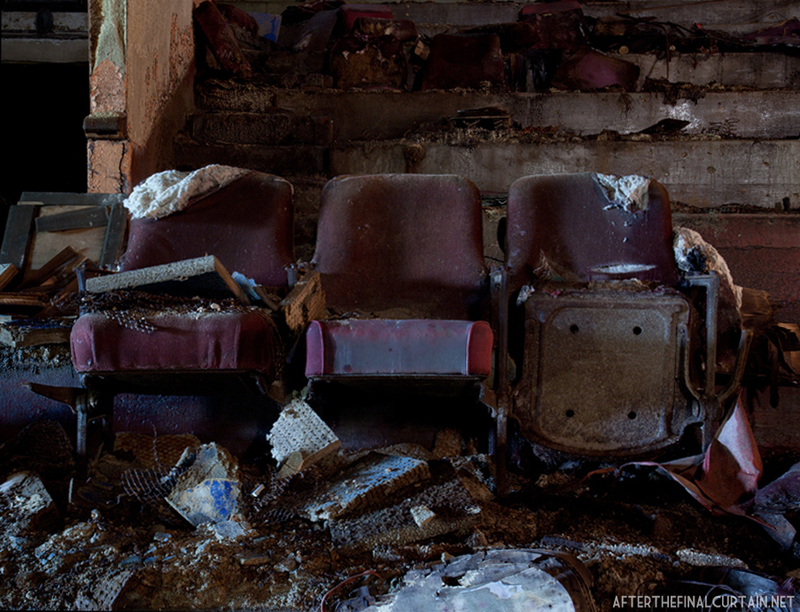 In the years since the marquee restoration many have tried — without success — to restore and reopen the Palace. View of the balcony level from the stage area. Some of the few remaining seats on the balcony. Thank you for posting this. I used to go to this theater years ago. It’s very sad to see it like this. 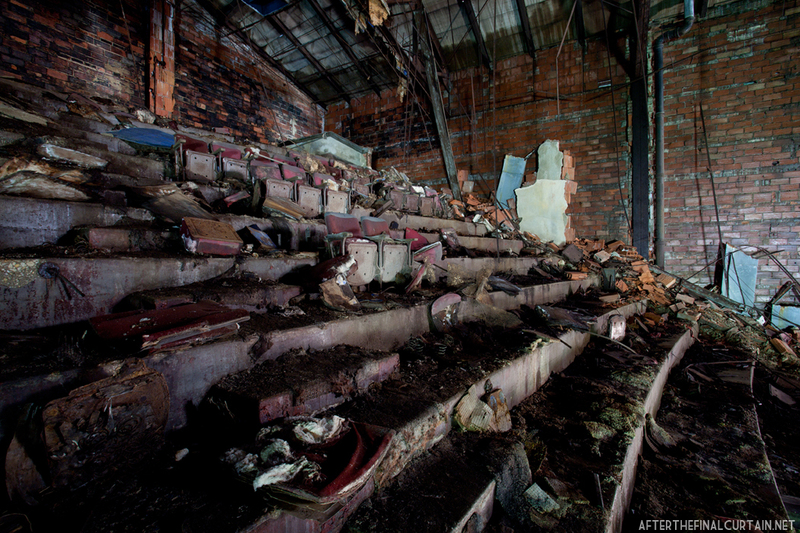 I’m usually the last one to say this, but I would rather see it demolished than allowed to stand in this condition. There is nothing left to restore and the soul has long since departed. 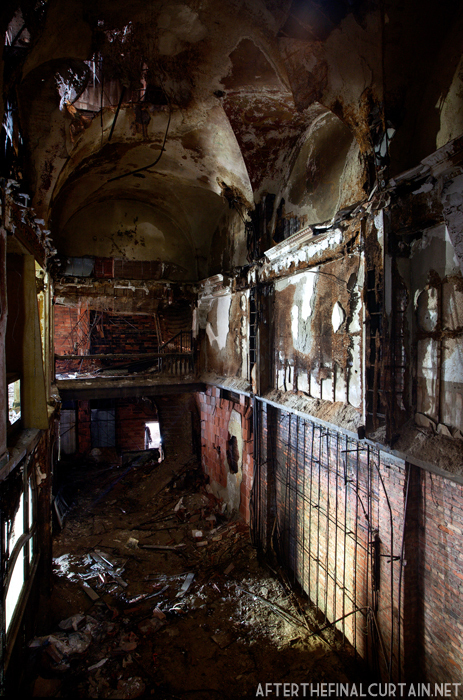 This is so sad to think it was allowed to deteriorate so badly. Thank you, Matt, for giving us this glimpse into what was. I USED TO GO THERE AS A KID. EVERY SATURDAY AND IF I LIKED THE MOVIE A LOT MY DAD WOULD TAKE ME TO SEE IT AGAIN. 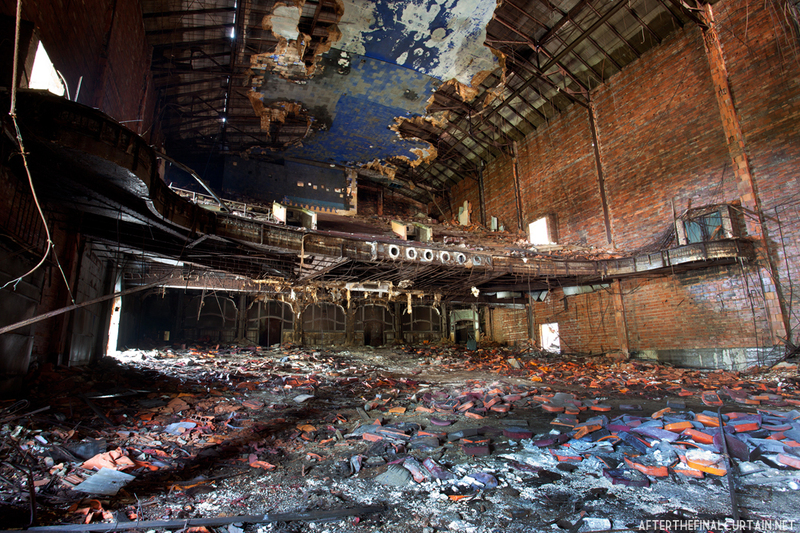 THE PALACE WAS A THEATER OF MAGIC. IT WAS A HAPPY PLACE TO BE ANYTIME. SO BEAUTIFUL IT WAS. ALWAYS PACKED ON FRIDAY AND SATURDAYS AND SUNDAYS. THE MOVIES THEY SHOWED WERE GREAT AND THE SOUND WAS AMAIZING FOR THAT TIME. GARY WAS A GREAT CITY. I WAS RAISED THERE IN THE 60S. NO ONE LOCKED THERE DOORS AT NIGHT. SO MUCH FUN ON SATURDAYS AND SUNDAYS IT WAS PACKED WITH PEOPLE SHOPPING AND EATING AT THE CAFES. NOW ITS A WASTELAND OF POVERTY AND CRIME. SO SAD.